The Smithsonian’s Center for Folklife and Cultural Heritage promotes greater understanding and sustainability of cultural heritage across the United States and around the world through research, education and community engagement. The center is a research and educational unit of the Smithsonian that produces the Smithsonian Folklife Festival, Smithsonian Folkways Recordings, exhibitions, symposia, publications and educational materials. It also maintains the Ralph Rinzler Folklife Archives and Collections. 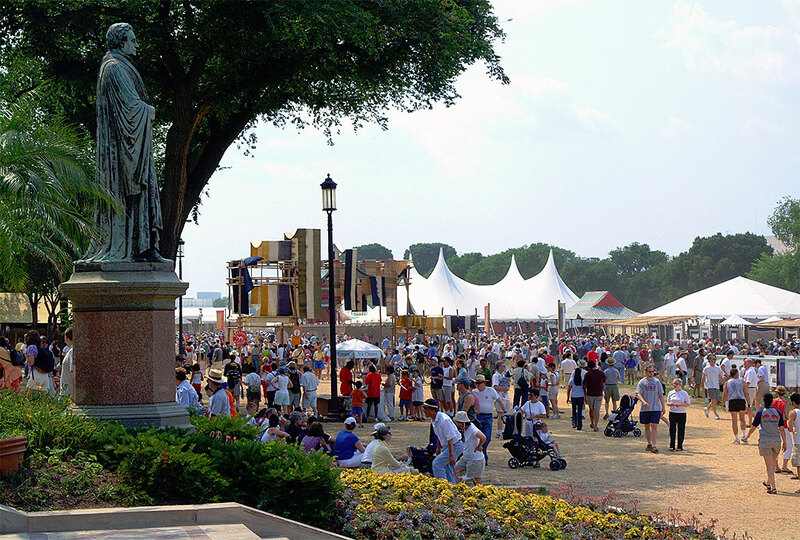 The Smithsonian Folklife Festival is a research-based presentation of living cultural heritage annually produced outdoors on the National Mall. The 10-day event provides a platform for cultural exploration, exchange and engagement. Since its inception in 1967, the Festival has highlighted artisans from all 50 states, more than 100 countries and nearly 70 occupations. Free to the public, the Festival drew 8.25 million visitors on site and online in 2017. In 2010, the Initiative for Global Citizen Diplomacy honored the Festival with a Best Practice Award for International Cultural Engagement, and, in 2017, the American Alliance of Museums recognized the Festival with a Sustainability Excellence Award. Smithsonian Folkways Recordings is the nonprofit record label of the Smithsonian. With nearly 60,000 tracks of digitized music and sound, Folkways is a cultural treasure with unique holdings in American folk, world music and children’s music, including special series dedicated to African American and Latino music. In 2017, the label reached 251 million listeners through radio, online streaming and sales. To date, the label has won six Grammy Awards, one Latin Grammy, 10 Grammy Lifetime Achievement Awards and 30 Independent Music Awards. With most of the world’s languages severely threatened, thousands of language communities have committed to revitalization eﬀorts, from documentation and renewal to maintenance. This project responds to that urgency by developing robust comparative research on revitalization eﬀorts in six minority language communities. My Armenia harnesses the power of storytelling to strengthen cultural heritage sustainability through community-based tourism development. This collaborative project between the people of Armenia, the Smithsonian and USAID aims to deepen understanding of the country’s living traditions and heritage sites. The Smithsonian Artisan Initiative is dedicated to building the sustainability of traditional culture. The program brings together community-driven research and documentation, product development, enterprise training, world-class design development and a suite of tools artisans can use to unlock access to both local and international markets. The Center for Folklife and Cultural Heritage is home to the Ralph Rinzler Folklife Archives and Collections, a public resource named for the founding director of the Smithsonian Folklife Festival. The center’s collections are global in perspective, covering world ethnic performance traditions, spoken-word recordings, sounds of science and nature, occupational folklore and family folklore. They focus on American, and more specifically Euro-American, African American, Caribbean and Native American musical and performance traditions. In 2015, UNESCO inscribed the Moses and Frances Asch Collection into its Memory of the World International Register.